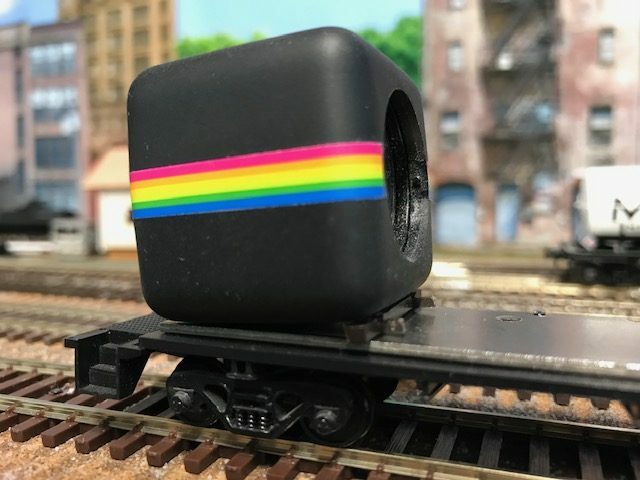 Polaroid Cube Video Camera mounts easily to HO-scale caboose chassis. 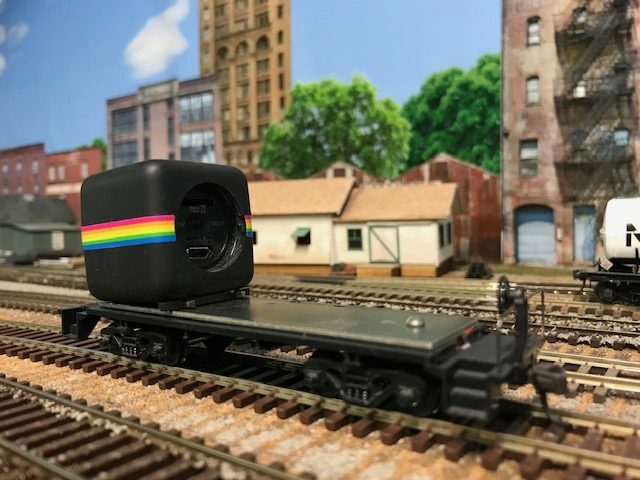 When Polaroid first introduced their Cube Lifestyle Action Video camera, I couldn’t help but notice its suitability and easy adaptability for use on an HO-scale railroad. Its light weight (49 grams), cubical shape, and small dimensions of only 1.4 inches allow it to fit on most any HO-scale flat car. I’ve even placed it on top of boxcars and covered hoppers for short distances. The base of the camera has a powerful magnet though, which makes it perfect for staying in position when placed on a flatcar that has a conventional weight plate mounted underneath the plastic deck. 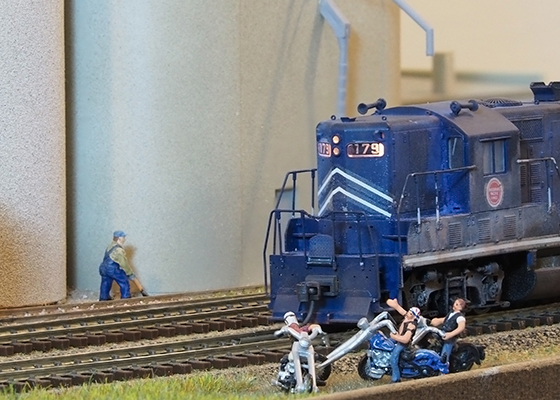 The camera holds fast when placed on the deck of any of these model railroad cars. The magnet is strong enough that it will pull the car right off the track when you go to remove the camera from the car. Because a caboose has one of the shortest wheelbases of most readily available HO-scale rolling stock, I decided to remove the shell off an old Athearn caboose and use it as my camera carriage. A bobber caboose or short flat car could be used as well. The goal is to use a car with as short a wheelbase as possible to minimize swing and camera angle when going around curves. You can take this to whatever extreme you want –even design your own one-truck camera-shoving platform I suppose. The Cube and many other small action cameras have a wide angle of view (124 degrees for the Cube). You can adjust the angle of the camera to capture a bit more of the rails and roadbed and less valance and ceiling by placing an extra tie, small piece of balsa wood, strip of cardboard, etc. just underneath the back of the camera. I decided that an extra track tie, with the track flanges filed off, gave me just the angle I wanted. The magnet is powerful enough to still make a secure connection with the metal weight on the car deck. 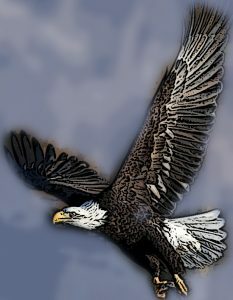 For variety in your shots, in addition to having the camera face straight forward, turn the camera to the side at any angle you desire. Place the car in front of the engine to video where the train is going, tack it to the end of the train to show where the train has been, or even place it mid-train for a unique perspective. Camera lens is facing left. Track tie placed under rear bottom of camera tilts it to capture more roadbed and less ceiling. Screw at left end attaching metal plate to deck was removed and plate affixed with adhesive so camera could sit flat. On the car I used, the metal plate was screwed to the plastic base from the top rather than from the bottom of the car. I removed the screw on the end where the camera will ride, and glued the plate to the plastic deck on that end using Walthers Goo adhesive. An alternate solution, with no work at all, is to employ a 40-ft flatcar like this Maintenance of Way flat to serve as your camera carriage. The metal weight plate under the deck holds the camera securely in place. 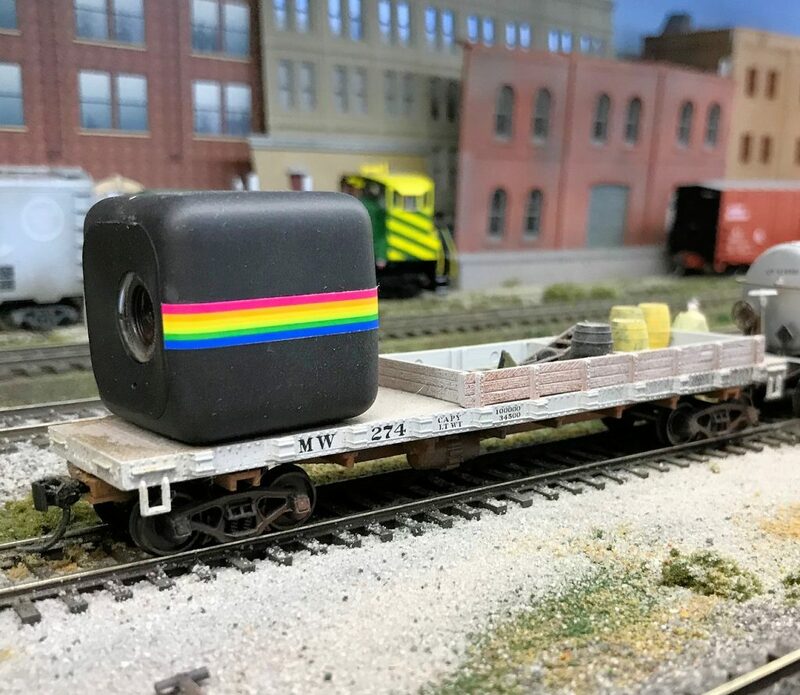 A 40 ft. flat car makes an ideal HO-scale camera carriage for the Cube. 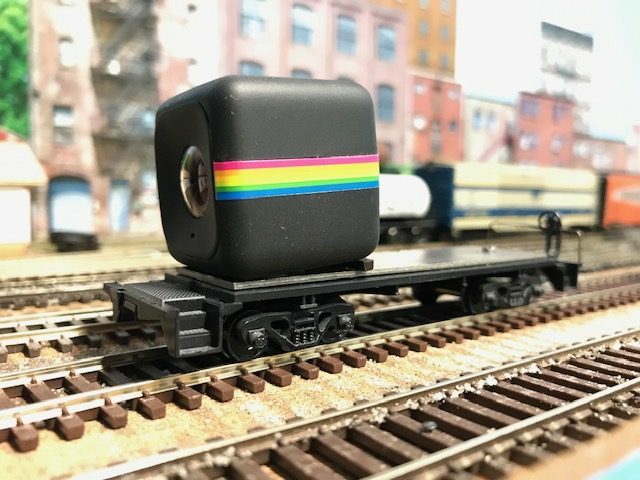 Here’s a short video recorded with a Polaroid Cube camera and the caboose camera car. camera car, HO-scale, video. Bookmark.